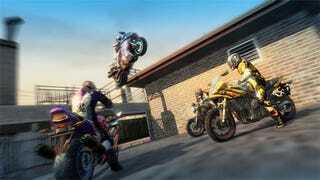 The Burnout Bike update is now available as promised for both the Xbox 360 and PlayStation 3 versions of Burnout Paradise, with Criterion having managed to update both consoles at once this time around without having to delay one or the other. Good job! Along with 2 different motorcycles to choose from, the update also ads 38 new timed race events, dynamic weather, 70 more freeburn challenges, and a 24 hour day / night cycle that affects traffic density and what events are available to play through. It's like adding a whole new game to an already existing game, for free. Makes you wonder if there'll be another Burnout game this console generation or they're just continue modding this one until the next systems come out. Either way, your bikes are here. Be sure to drive irresponsibly.